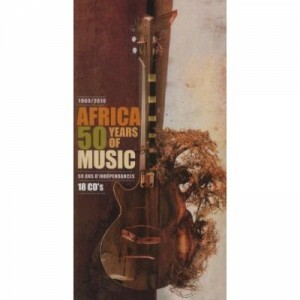 If you didn’t buy the compilation of 2010, “Africa 50 years of Indepdence 1960-2010” you are forgiven only as long as you are ignorant of this album, and you have just lost that right by reading this post (sorry about that!). In fact I’m opening a new category just for this album because it is one of the greatest collections of African music for African aficionados that’s been compiled period. Splitting the continent along geographic lines will see three CDs on West Africa, South Africa, South Eastern Africa…and all the others…..it’s all there. What’s lovely about this album (which finally spreads itself out over 18 CDS) is the accompanying booklet that comes with the CDs. Sleeve notes, all but abandoned in this digital age, are and remain an integral part of any music compilation and the booklet is more akin to a encyclopedia of African music. So, if you’ve not bought this album and you love African music and the reviews on this website, save up and get this legendary addition to your collection.